George Denis Patrick Carlin was an American stand-up comedian, social critic, actor, and author ~ born in 1937 and died on June 22, 2008 at the age of 71 ~ but his truth lives on. On the anniversary of his passing seven years ago, I pay homage to his courage and willingness to speak his truth to power ~ for George Carlin remains a hero to all those who seek the truth, including myself, as well as a constant inspiration to those who would speak their truth during these disingenuous times. Here's George cutting through the layers of deception and revisionist history of the American government to concisely explain the real objectives of our rulers upon the population, despite what they say to the public. You really don't need to read very far into this subject to reach a similar conclusion. 3 minute YouTube video ~ with over 5 million views. 8. Ever notice that anyone going slower than you is an idiot, but anyone going faster than you is a maniac? 10, I have six locks on my door, all in a row. When I go out, I lock every other one. I figure no matter how long somebody stands there picking the locks, they are always locking three of them. 12. They show you how detergents take out bloodstains. Think if you've got a T-shirt with bloodstains all over it, maybe your laundry isn't your biggest problem. 14. A lady came up to me on the street, pointed at my suede jacket and said, "Don't you know a cow was murdered for that jacket?" I said "I didn't know there were any witnesses. Now I'll have to kill you too." 15. Future historians will be able to study at the Jimmy Carter Library, the Gerald Ford Library, the Ronald Reagan Library, and the Bill Clinton Adult Bookstore. 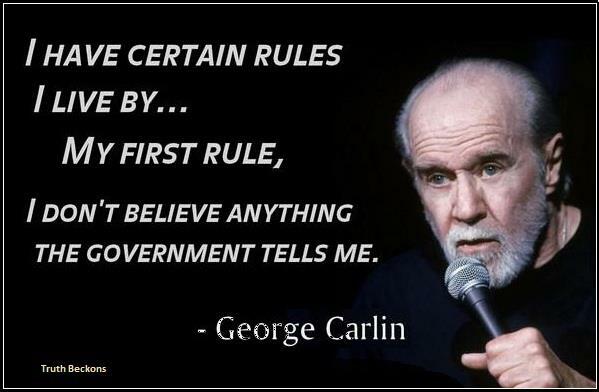 The magic of George Carlin was his ability to make me laugh at myself, the government and the blatant disingenuous nature of our times ~ it seemed almost Zen-like, and I believe it was, for Carlin indeed knew how to plant ideas in our minds, much like Twain, with his irreverent truth and humor.